I finished Faceted Jewels by Glad Creations on the 26th, TWO days ahead of my irrelevant but all important in my mind deadline. I started this quilt back in the fall then stopped to participate in the Red and White Snowball Challenge. I got it back out a couple of weeks ago, with the fabric choices and cutting all done I was able to whip this thing together in no time. The original pattern was to finish at 80" x 104". I reduced the blocks from 12 inches to 9 inches. This quilt is 60" x 78". Originally I reduced the block size because I wanted a smaller quilt. I figured out that if I made fewer blocks, the overall pattern would be impacted. Now that it's done, I'm so glad I reduced the block size, I think the design looks great a little smaller. The border took longer to piece than I expected but none of the piecing on this quilt was hard. I got a few comments that this pattern looked complex but it's really not. Just a few flying geese, triangle in a square blocks, four patches, and half square triangles. A total of 2,192 pieces are required for this pattern. The instructions for this pattern were great! My only complaint, no suggestions for quilting! I"m guessing an overall pattern would work best, but I'll just have to wait and see what my quilter thinks. Any suggestions? Here's all the leftover pieces and parts.....packed away and stored with all my other leftover pieces and parts! It's really beautiful! 2192 pieces - WOW! AAAAAHHH!!! I love it soooo much. That is my fav of all your quilts so far. It is amazing!! I also love the blog update!! It looks great! It looks fantastic! I love it when you get the curved effect even though it is all straight piecing. So much impact for not too much effort. absolutely amazing! stunning...i love the jewel tones. in ah really. This is a WOW quilt, beautiful! Who was patient enough to count? :-} A great finish, whether on time or not. Look how cute and colorful your blog is! What a fun makeover. Oh. My. Faceted Jewels is gorgeous -- it's just mesmerizing. You've been busy! Thelma it is gorgeous! I love your blog makeover! LOVE LOVE LOVE your new blog!!! It's gorgeous! Beautiful quilt and great new look for your blog. I don't think you've shown us the quilt that's second from the left in the top row of your banner, have you? It looks like it won a ribbon, too. Can't wait hear its story and to see a closeup! Thelma your new blog look is great as is your Faceted Jewels quilt. Hard to believe that with all the straight piecing it has a curved look. Gonna add this to my ever growing list of things to do. What a terrific new look for your blog!! I love it. The Faceted Jewels quilt is simply amazing. The design does look really complex. I just keep staring at it--all the different colors just sparkle. Absolutely gorgeous. I need to add this one to my stash. 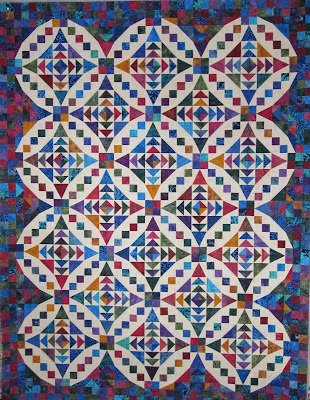 I love your Faceted Jewels quilt, especially the border! Fantastic. Your blog redesign is very cool - so fresh for spring! Absolutely stunning!!! And your new blog look is great too. Very creative. I still haven't even figured out how to add a picture under my blog name, let alone do all the fun stuff you did. Good job. I really love this quilt! I wasn't so sure until I saw it all, together. It looks stunning. You picked perfect fabrics! This is one of your best. Do you ever run out of great ideas?! Love the new look of your blog as well. How the heck did I miss this post, Thelma??? Your Faceted Jewels quilt is beautiful - awesome! this is freakin' AWESOME, Thelma!! !